These are two separate tickets placed side by side in the photo. The one on the left is a Republican Party Illinois Election Ticket as verified by Library of Congress. The one on the right would be the Democratic Party Election Ticket, researching James Allen who name is found under governor on the ballot we know he served in both the 33rd and 35th Congress of Illinois before unsuccessfully running for Governor. The year 1860 is handwritten on both ballots. Richard Yates was the Republican nominee for Illinois Governor who won that election and remained in that office throughout the Civil War. The way people voted is much different from today. These tickets featured in the Church collection may have been part of a party newspaper. Typically, voters could cut them out and present them at a polling place. 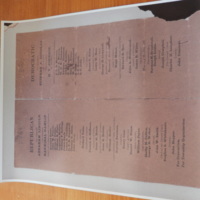 “1860 Campaign Tickets for Democratic and Republican Party,” UIS History Harvest, accessed April 22, 2019, http://uishistharv1.uis.edu/items/show/212.